Gelleesh: Free Movies, Are you up for it? Ayos na Ayos! Free Movies, Are you up for it? Ayos na Ayos! I’m a big fan of online shopping. You just sit in front of your computer, click, click, click and you’re done. I’ve also had my fair shares of selling stuff online. You know the drill, click, click and click and it’s up! Buying and selling stuff online has been more convenient since websites like AyosDito.Ph has sprouted out. Honestly, stuff online are way cheaper than stuff up in the local counters and you can get and bargain for better deals. Sweet, eh? Well to excite the website’s users more, AyosDito.Ph has come up with an awesome surprise for its users. Are you ready? Are you really really ready? This May, Team AyosDito.ph, in cooperation with SM Cinema, will be giving away 100 Free Movie Passes weekly beginning April 30 to June 2, 2013. This really makes it a “Mas Ayos Dito!” selling experience on AyosDito.ph. “We want to teach our advertisers especially our private sellers to talk about their ads more so they can also sell their items faster. To achieve this, we partnered with SM Cinema, to reward out popular ads weekly,” Santico added. 1. To join, simply post an ad on AyosDito.ph. 2. Once your ad has been approved, publicly share it on Facebook via the Share on Facebook button on your ad page. 4. 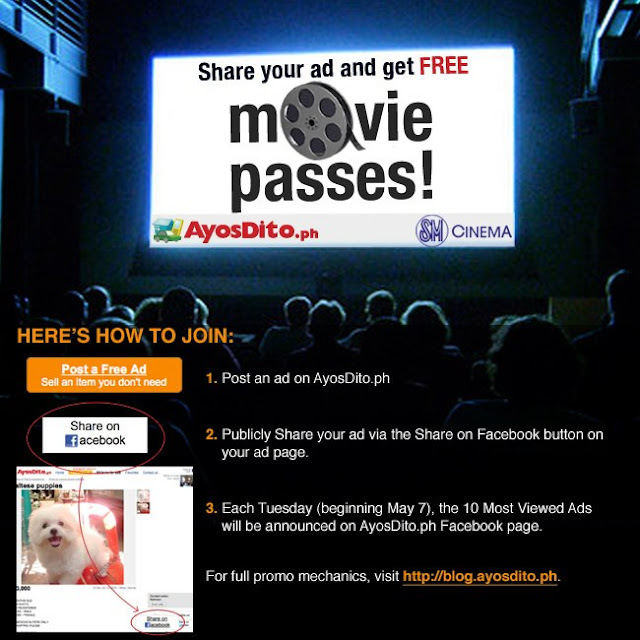 Anyone can share AyosDito.ph ads but only the ad owner will be qualified to win FREE Movie passes. 5. Metro Manila (NCR) winners can claim their passes at AyosDito.ph Makati office. Provincial winners’ prizes will be mailed. 6. The movie passes may be redeemed at any SM Cinema. 7. Employees of 701 Search Inc. and its suppliers, partner agencies and relatives up to the second degree of consanguinity are not qualified for this promo. Isn’t it awesome? I will definitely re-post some of my ads. I have been a bit inactive these past few months and I actually still have some makeup stuff to sell and hopefully I get picked! Keeping my fingers crossed. How about you, are you a fan of online shopping? Or are you an online seller, yourself? Have you tried AyosDito.Ph? What's Going down i am new to this, I stumbled upon this I've found It absolutely useful and it has aided me out loads.